Final Fantasy is one of the most popular gaming franchises ever. It’s been around since the 80’s and there are dozens of games in the series. As it turns out, some of them are on mobile. We can help you find the very best ones. Here are the best Final Fantasy games on Android. Final Fantasy XV: Pocket Edition is coming out soon. Assume that’ll be on the list when it comes out. Here are some more game lists featuring Final Fantasy and other RPGs! Square Enix ported many of its console Final Fantasy games to mobile. That includes many from the main series. The options include Final Fantasy I, II, III, IV, V, VI, VII, and IX. Additional options include Final Fantasy IV: The After Years and Final Fantasy Tactics: War of the Lion. The ports are all generally excellent. Some of the games even have new features and graphics. Final Fantasy IX has a fast-forward mode, for instance. The games can get rather expensive. However, you get the full experience with no advertising and no in-app purchases. Dissidia Final Fantasy Opera Omnia is one of the newer mobile Final Fantasy games. It has a lot of the same style as other freemium Final Fantasy games. You collect a cast of Final Fantasy characters from past and current games. The combat is turn by turn. Additionally, the game features online social mechanics, and a story line to follow. It’s still new and it has a few bugs. However, those should get fixed as time goes. It’s an above average freemium Final Fantasy title. 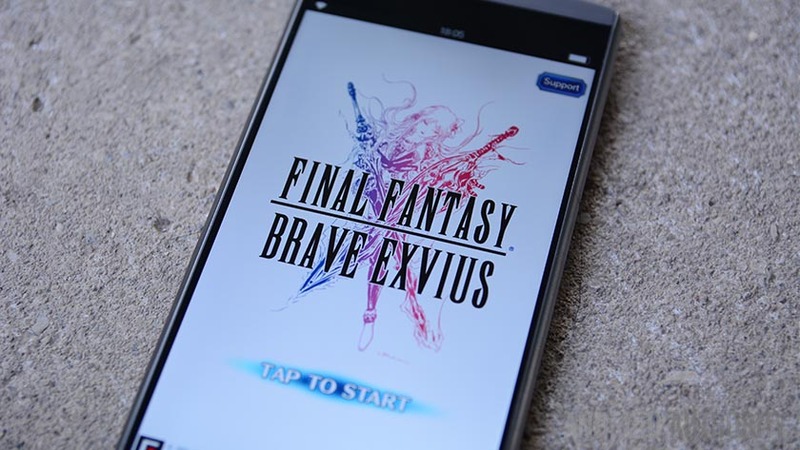 Final Fantasy Brave Exvius is among the most popular mobile Final Fantasy games. The story revolves around two heroes trying to save the crystals. You can unlock various characters from other Final Fantasy games to aid you in your quest. The game features raid bosses, tons of levels, public events, PvP, and more. It also includes dungeons and towns for you to explore. It’s a freemium game. However, it’s also one of the better freemium games out there There isn’t a whole lot wrong with this one aside from it getting very repetitive eventually. Final Fantasy Dimensions is Square Enix’s premium made-for-mobile franchise. These games don’t have in-app purchases and have single purchase price tags. The first game is a classic jRPG title. You explore a world, beat the bad guys, and enjoy old school Final Fantasy goodness. The second Dimensions game follows a mobile setup. You collect good guys, form a team, and beat up the bad guys. It’s an interesting experience without the freemium stuff bogging down the works. People gave Dimensions II a bit of an unfair shot as they were expecting something closer to the first game. In any case, these are good games. Final Fantasy Record Keeper is the definition of fan service. The game lets you recruit characters from various Final Fantasy games. You then play through scenarios from the older games. The premise is that you have to reset history to make sure everything happened as it was supposed to. The game also includes weekly events, various abilities and equipment to collect, and more. It’s another freemium game. It’s a little more aggressive in its freemium strategy than Brave Exvius. That said, reliving those old game memories can be fun for many. Thank you for reading! Here are some more great game lists for you! If we missed any great Final Fantasy games for Android, tell us about them in the comments! You can also click here to check out our latest Android app and game lists!